Janus Still Flying- the Currie Flag. 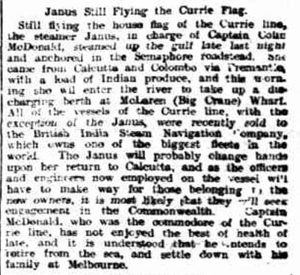 Still flying the house flag of the Currie line, the steamer Janus, in charge of Captain Colin McDonald, steamed up the gulf late last night and anchored in the Semaphore Roadstead. She came from Calcutta and Colombo via Fremantle with a load of Indian produce, and this morning she will enter the river to take up a discharging berth at McLaren (Big crane) Wharf. All of the vessels of the Currie line, with the exception of the Janus, were recently sold to the British India Steam Navigation Company, which owns one of the biggest fleets in the world. The Janus will probably change hands upon her return to Calcutta, and as the officers and engineers now employed on the vessel will have to make way for those belonging to the new owners, it is most likely that they will seek engagement in the Commonwealth. Captain McDonald, who was the commodore of the Currie line, has not enjoyed the best of health ot late, and it is understood that he intends to retire from the sea, and settle down with his family at Melbourne.